Enjoy a romantic sunset from the spacious and stable Pride of Maui! 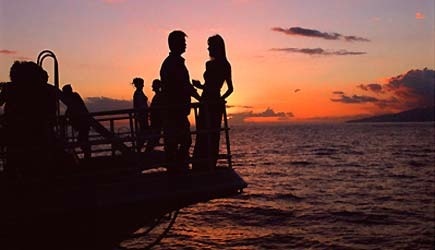 The Pride of Maui Sunset Grill Cruise is a great way to see Maui’s majestic coastline. The entrees include baby back ribs hot off the grill, Hawaiian chicken breast, Maui onion tartlets, grilled vegetables, imported cheeses, marinated artichoke dip, Kula strawberry shortcake and more. Bartenders at the premium open bar will craft everything from martinis to margaritas. And enjoy the sounds of Maui boy Mitch Kepa, whose repertoire includes a mix of Hawaiian, classic rock and dance music. This is an excellent value in a full dinner cruise! 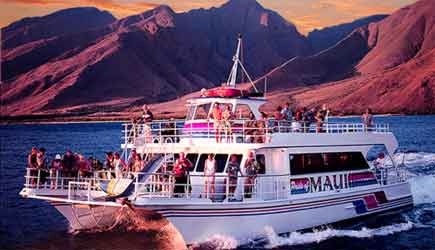 The Pride of Maui features a spacious downstairs cabin with dancing and live music. Upstairs is a romantic open-air deck which is great for relaxing and watching the sunset and the twinkling lights of South Maui. The Pride of Maui Sunset Grill Cruise sails from Maalaea Harbor and is a great option for those staying in South Maui (Kihei and Wailea), or Central Maui. This is also a great way to watch whales in season! 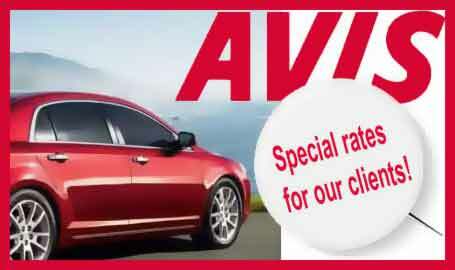 Just check your dates carefully since this is only offered on Tuesday, Thursday, and Saturday. 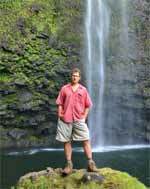 Pride of Maui is dedicated in doing their part for our environment. They use of organic and biodegradable cups, straws and serving ware. As well as providing “reef safe” sunscreen and using eco-friendly cleaning supplies. Great food, drinks, and music! NCL Pride of America cruise ship passengers who come into Kahului are not able to do this tour because it isn’t operated on Sunday evenings. Lahaina cruise ship passengers can do this tour on their first day in port if their ship is spending the night in Lahaina and it requires a 20 minute cab ride to Maalaea Harbor or a rental car. Occassionally I’ve heard clients say “We could have gotten a nicer meal for the same money in a restaurant.” I think that’s stating the obvious … you aren’t just paying for a meal on a dinner cruise … you are paying to go out on a boat, and as a boat owner I can tell you that they are EXPENSIVE to operate and maintain. If you don’t get your expectations too unrealistically high you’ll have a great time. The Pride of Maui has now upgraded their cocktail cruise to include entrees. It is a large, stable and very spacious boat for enjoying dinner out on the water. There’s alot of room to move around and to find a little privacy if you want to get off by yourself. We’ve always said that this was a good choice for people staying in South Maui who wanted to get out on the water at sunset. Well, we’ve now changed our mind. The Pride of Maui sunset grill cruise is so good – it is even worth the drive from Lahaina and Kaanapali too! The only down side is that you don’t sit at a table on the Pride of Maui. This is a large, stable vessel and there are plenty of places to sit down…but not at a table…so you’ll be holding your plate while you eat. But from our experience it’s worth it – the food is pretty good and this boat has a less crowded feel than some of the other boats where everyone sits at a table. Another Lahaina Harbor options is Maui Princess. For guests staying at Kaanapali we recommend Teralani Sailing or Hula Girl.